“I sympathize with Giboulot’s dilemma, and if his vineyards stood in isolation, I would support his refusal to spray.” In a thought-provoking column, Mitch Frank takes issue with Emmanuel Giboulot’s refusal to spray pesticides. 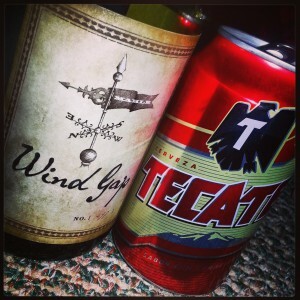 “The odd juxtaposition of fine wine and Mexican lager, specifically, has become a sort of wine world trope thanks to Instagram.” In Grape Collective, Jameson Fink chats with Talia Baiocchi. “Free in spirit and style, they are making wines inspired both by what has always done well here in Northern California… and also experimenting with grapes we’ve forgotten or never gotten to know.” In Sonoma Magazine, Virginie Boone profiles William Allen of Two Shepherds, Csaba Szakal of En Garde, and Andrew and Adam Mariani of Scribe. “But if anybody can fight the fallacies of a continent’s wines as being either cheap, ripe, and syrupy or expensive, ripe, and syrupy, it might just be a small group of renegades out of Victoria called the South Pack.” In Palate Press, Lauren Mowery writes about a group of friends who are re-imagining Australian wine. “My succession plan so far has been that I plan never to die.” In Wine-Searcher, W. Blake Gray profiles Josh Jensen, the founder of Calera. He recently celebrated his 70th birthday. In a separate piece, Gray profiles Spottswoode. “After 40 years working in oenology, I feel no need to justify myself regarding the inevtible attacks from critics.” Harpers chats with international wine consultant Michel Rolland. “New research suggests that wine may help your kidneys for the same reasons it helps your heart.” Esther Mobley has the details. Siduri is celebrating its 20th anniversary. Huge congratulations to Adam and Diana Lee!